Looking for a creamy macaroni salad with the crisp crunch of fresh summer produce? Check out our macaroni salad with cucumber and radish recipe! Growing up, I remember having macaroni salad at most meals during the summer. It, unfortunately, was not something I looked forward to because my mom put some of my least liked produce in it like raw onion (I love the taste but my body doesn’t), bell peppers (thankfully I like those now) and chunks of raw tomato (something I’ve never really liked). But, I, of course, loved pasta and the creamy dressing. So, I’d actually still pile some on my plate and just pick out all the veggies. As such, I hadn’t ever made macaroni salad, and just recently picked up some at the grocery store to try and really enjoyed it. 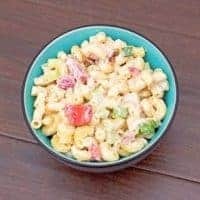 That, of course, meant I had to try making my own and thus this deliciously creamy and crunchy macaroni salad with cucumber and radish recipe was born. You can use whatever vegetables you like and it’s a great way to use up those extra salad veggies you have in your fridge that are starting to be on their last leg. We used radishes, cucumbers, red bell peppers, and green onions. I think that carrots, celery, corn, and raw onion, and even tomato if you like those sort of things, would also be great. If you’re a cheese lover like me, I also sprinkle a little feta over the top right before I ate mine. I don’t think it would be so great to put into the macaroni salad when you make it, because it really should set overnight to marry the flavors and I think the cheese would just get too wet. I have to say, we loved this macaroni salad so much I definitely plan on trying different flavor combinations over the next few months and am kind of sad I waited so long to try it again. Here’s our macaroni salad recipe if you’d like to try it yourself! For this recipe, you definitely want a large container and I love these large plastic containers because I can make the dressing in them, and then add in the veggies and pasta right in and then refrigerate and even serve all in the same container. Hooray for less dishes to do! You’ll also want a good knife for all the chopping. I really like the Pure Komachi knives as they are pretty easy on your budget, but feel and work great. This creamy macaroni salad with cucumber and radish is full of cool, crisp summer flavors. Bring a large pot of water to boil, stir in salt (I don't measure but use around a Tablespoon), and add macaroni, cooking according to directions on package. In the mean time, make your dressing by whisking together mayonnaise, vinegar, sugar, mustard and salt and pepper to taste in a large bowl. Set aside. While macaroni finishes cooking, chop green onion (use both green and white parts), bell pepper, radishes and cucumber into bite-sized chunks and stir into dressing. One pasta is cooked to your liking, immediately drain and rinse with cold water until cooled. Drain pasta thoroughly and stir into the dressing and veggie mix until everything is covered with dressing. Taste again for seasoning as you may need to add more once you add the pasta. Cover bowl or place into covered container and refrigerate at least 4 - 8 hours, or preferably overnight, before serving. Leftovers can be stored covered in the fridge for up to 3 days. Feel free to add additional veggies or substitute with other veggies you like more such as carrots, celery, tomatoes, etc. We hope you enjoy this Macaroni Salad with Cucumber and Radish Recipe! 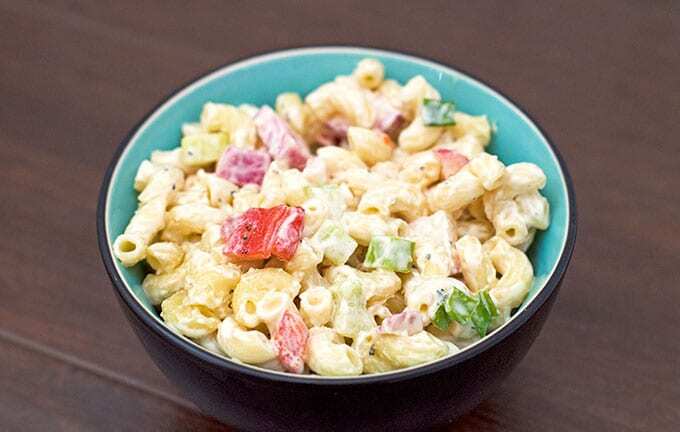 What are some of your favorite ingredients to add to macaroni salad? This looks tasty. I have never tried cucumbers in my macaroni. I am really interested in making this. I think my family would enjoy it.